This content rich educational conference gives the techniques, strategies and resources for maximizing collection and recovery outcomes. Our goal is to enrich the intensity of the conference for the exhibitor, attendee and sponsor alike with an unparalleled learning experience. This is an exclusive gathering of industry professionals like none other! Senior-level creditors involved in collection, recovery operations, compliance, risk, and strategy are invited to attend this exclusive meeting. Registrations will be accepted on a first-come, first-served basis. If you are a senior level creditor involved in collection and recovery, and are interested in receiving an invitation, please contact us at (562) 906-1101 or E-Mail: CRS@resourcemanagement.com. Entirely creditor-focused, with exciting presentations by leading creditors. Round table sessions for in-depth peer networking and best practices discussions are just part of an exciting agenda. One of the most influential and respected figures in the technology, economic and business worlds, Rich Karlgaard advises audiences on how to harness an organization’s disruptive spirits to maximize business opportunities in the global marketplace. As an expert in artificial intelligence, blockchain and the internet of things Rich is also a regular panelist on one of cable news' most popular business shows, Forbes on FOX. He is a co-founder of Upside magazine, Garage Technology Partners (with Guy Kawasaki) and Silicon Valley’s premier public business forum, the 7,500-member Churchill Club. For the latter, Karlgaard won an Ernst & Young Entrepreneur of the Year Award. Karlgaard’s book on innovation culture, The Soft Edge: Where Great Companies Find Lasting Success, rapidly became Amazon’s top seller in the category of Strategy and Competition. Management guru, Tom Peters wrote: “The Soft Edge is brilliantly organized and written—and its peerless message is right on the money for our chaotic times.” Harvard Business School professor Clayton Christensen, wrote: “Rich Karlgaard is a navigator for the rest of us.” The Soft Edge made the lists of top business books of 2014 for Inc., Time.com, Value Walk, 800-CEO-READ, Huffington Post, and Forbes India. His 2015 book, Team Genius: The New Science of High Performing Organizations, was published in 2015 and has been endorsed by Satya Nadella, CEO of Microsoft and Fred Smith, CEO of FedEx. In his biweekly Forbes column, Innovation Rules, he provides an honest and incisive assessment on a broad range of emerging issues. 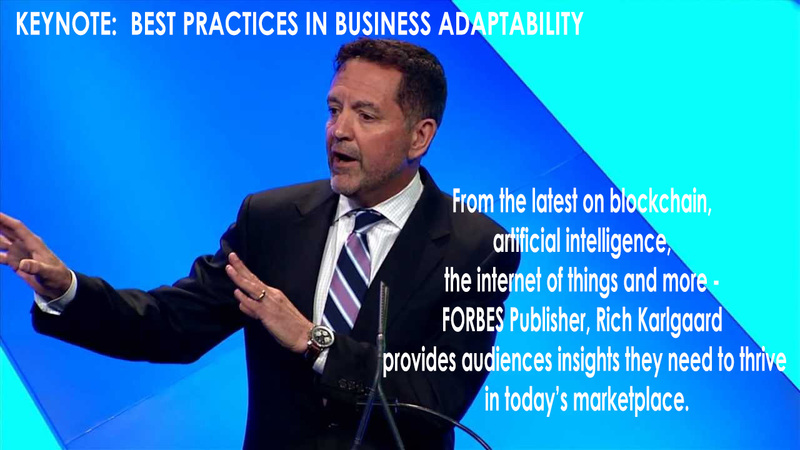 Rich brings the same candor and vision to his bespoke and wildly thought-provoking presentations, as he reveals a prospective and comprehensive analysis of the disruptive forces that are reshaping your industry. Rich equips today’s leaders with timely insights that help them adapt to the era of technological and political disruption and thrive in an increasingly competitive global marketplace. Collection and Recovery Solutions 2019 conference will be held at the Four Seasons Hotel Las Vegas. Serenity does exist in Las Vegas ... in a tranquil non-gaming atmosphere with warmly residential style. Steps from the Strip's casinos and shopping, Four Seasons offers a graciously intimate environment – a secluded oasis in which to relax and recharge. Four Seasons provides a uniquely calm and personalized approach to Las Vegas vitality – creating an experience so appealing that frequent guests find it hard to imagine the city any other way. Four Seasons is a small, intimate hotel by Las Vegas standards. Accommodations are high above the crowds – set on the 35th to 39th floors of the Mandalay Bay tower and accessed exclusively by Four Seasons express elevators. The high position and floor-to-ceiling windows ensure unsurpassed vistas of the scenic mountains and desert, the pool and gardens, and the glittering Las Vegas Strip. Room Rate: We are pleased to announce the discounted guest room rate of $285 per night, which is for CRS2019 registered conference attendees only. Recovery Management Network (RMN) is a unique networking organization strictly for creditors, providing collection and recovery professionals with the peer contact, resources and information they need to succeed in their jobs. Resource Management Services, Inc. is sensitive to anti-trust concerns, and is working with Mr. Oscar Marquis of Oscar Marquis & Associates who will be present throughout the event to help avoid potential anti-trust issues. This service is being provided as an accommodation to the attendees at the Collection and Recovery Solutions conference to assist with anti-trust issues. Got some questions about our CRS conference? Collection and Recovery Solutions is proudly produced by Resource Management Services, Inc.
Website: Resource Management Services, Inc.
CRS2019SM and Collection and Recovery SolutionsSM are service marks of Resource Management Services, Inc.